Who's getting excited, nervous, scared and psyched for Marathon Monday at the 115th Boston Marathon? I know I've been feeling of all of the above, plus add doubt, frustration and worry. If I was more honest about sharing everything that happens with me over the course of winter and early spring marathon season, you'd know why. But that's another story in itself. Instead, I'm trying to whisk those thoughts of "Am I going to finish?" and "How much are those hills going to hurt?" out of my mind by focusing on one of the race weekend's events that I love: shopping the expo. Adidas. It's hard to miss this one--I think I've entered the expo right by the Adidas space every time I've gone to Boston--and it's hard not to pass up some of the official Boston gear. Who doesn't want a jacket to sport around town all weekend? 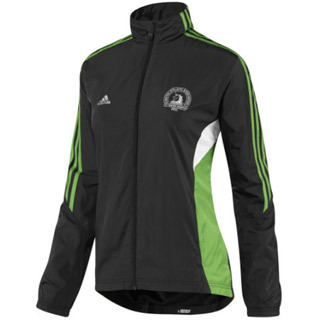 Or how about a new running outfit emblazoned with the BAA symbol and those famous three stripes? It's going to be hard to keep the Supernova convertible jacket from making it into my arms--same with the short tights and track jacket. Brooks. I have a feeling I'm going to be making a stop at Brooks' BRASH booth, a fun take on the TV show MASH. But not for remembering Vietnam or the TV show that my dad just had to watch when I was a kid, but to take advantage of the BRASH perks: gait analysis and doctors on-site to answer runners questions. And if you're thinking the 60-degree forecast is sounding a little warm for what you've packed for race day, consider the Versatile EZ Racerback (women's) or the Versatile Sleeveless (men's), especially if you're a blue fan like me. Nike. I'm never disappointed when I visit their space at an expo--I always find something to drool over from T-shirts to shoes to pace bracelets. And from the looks of what you can purchase in their online store, I know I'm not going to be disappointed. I can't decide between being a "Heart Breakah" or a "Wicked Fast Runnah." Stay tuned for more happenings at the expo, there's more to come, including news about Ryan Hall and Kara Goucher, two Fit-Ink favorites. Fit-Pic: This is Vail's Spring?